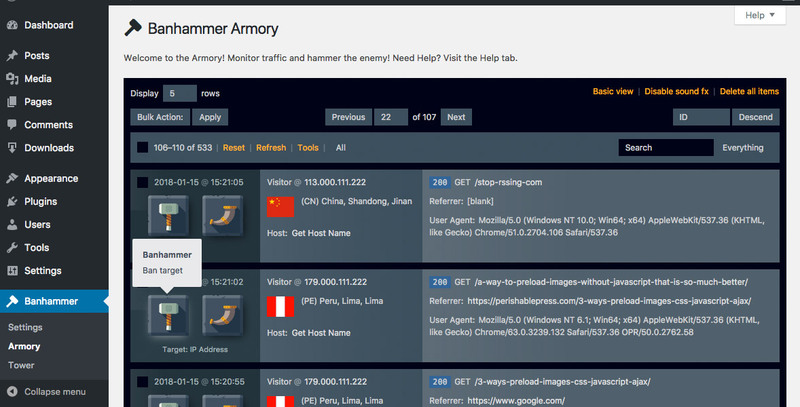 Banhammer makes monitoring traffic and banning visitors crazy easy and fun. Say your forum is being harassed some dirtbag. Or your admin directory is crawling with bad bots. Or some script kiddie is trying to brute-force your login page. Don’t just sit there and watch it happen.. drop the Banhammer on those fools and block them forever. 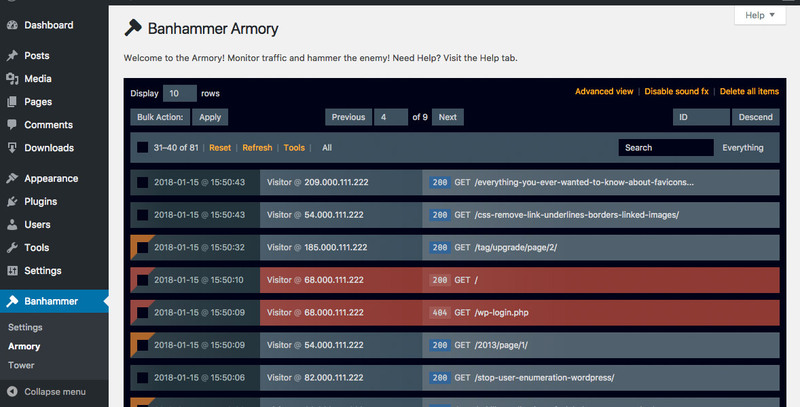 Banhammer gives you full control over who and what may access your site. Visit the Armory to monitor traffic and review suspicious visitors. If you find some user or bot that is causing problems, you can ban them with a click. Or, if you just want to keep an eye on someone, you can flag them with a warning. Any banned users will be denied access to your site, until you restore access. 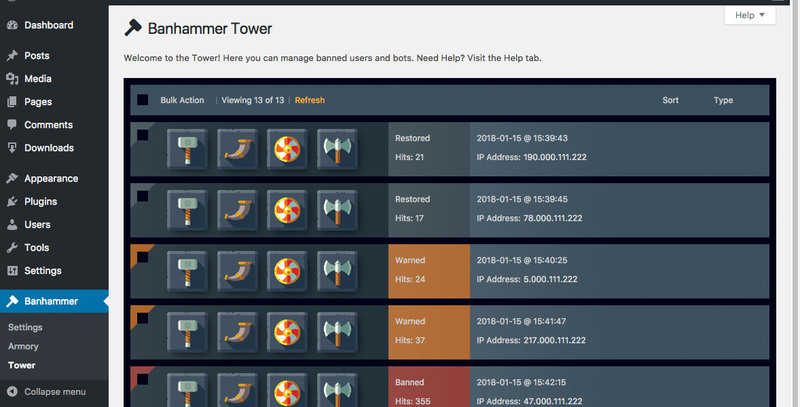 Check out the video and screenshots to see Banhammer in action! Check out some screenshots (click thumbnail to view full-size image). Hit the Help tab for more information and tips! 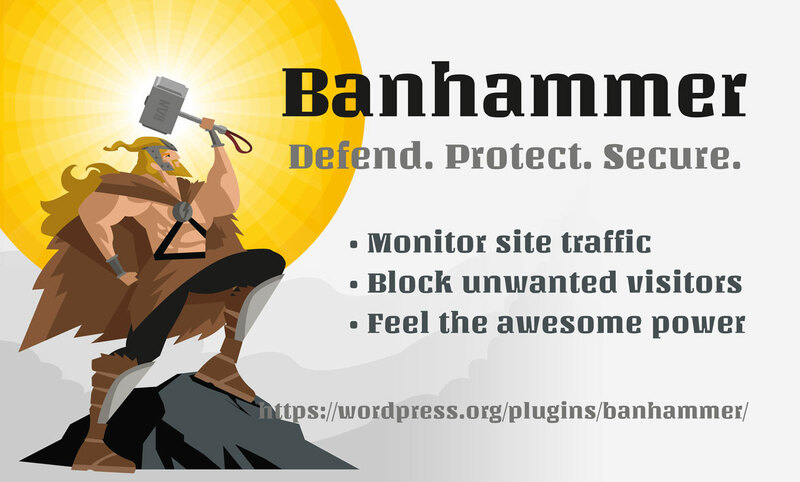 Banhammer is perfect for site owners, admins, and developers who want to keep an eye on traffic and block any unwanted visitors. It is a simple, flexible, and powerful security solution. A perfect security solution for the best WP sites. 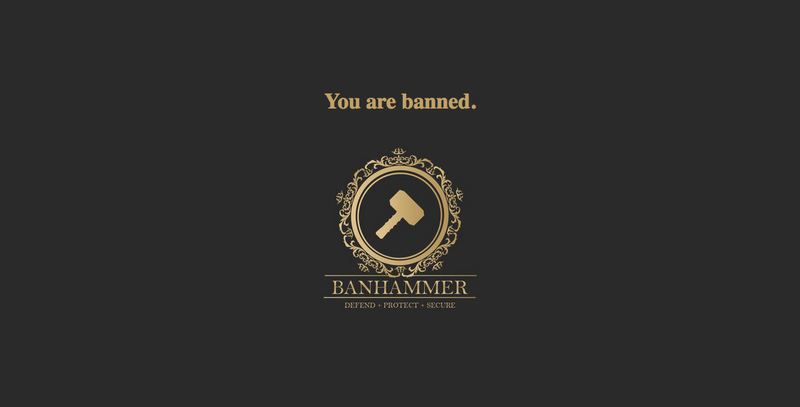 Banhammer Pro coming soon now available! My 2 cents: Why don’t you design the admin page the same UI as WordPress? Thanks Anh. Most of my plugins use the WP UI, and in general it’s best to do so. But in this case, I had a specific vision in mind for the data sorting, with Ajax navigation, sound effects, and so forth. 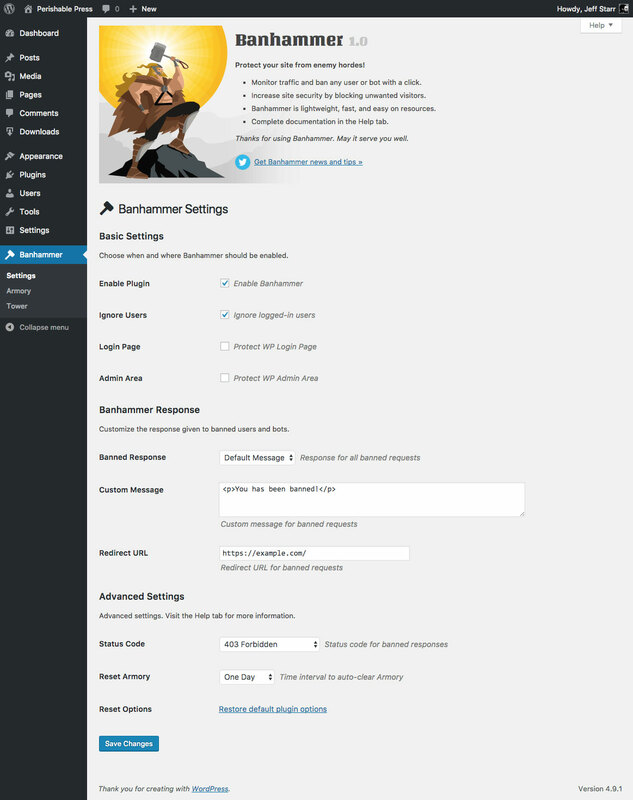 So it was necessary to go beyond the default WP UI for this particular plugin. And actually, everything except for the #banhammer container <div> is pure WP API. It’s quite elegant, please take a closer look. Is country blocking an option as well? Not yet, but it may be a feature of either free or pro at some point. Look like a great plugin. Going to try it out. That’s one for the “Toolbox”! I pretty much have been using an “outside of WordPress” solution for a while, but this makes for one an easier installation for most users. Yeah thanks Jim, that’s the idea: something useful, simple, and even “fun” to use. Working on the pro version now, has a lot of great additional features. Cheers! Any plans of incorporating the use of lists from StopForumSpam? I was thinking of adding that feature to my site-wide anti-hammering system, together with getting daily updates of StopForumSpam’s black-lists (automatically). I have noticed there are some IP’s that repeatedly try my security protocols. I typically set IP-based bans for twenty-four hours for most of them, and a few days for the worst offenders. This takes into account that some of these IP-addresses translate into proxy server addresses (which may change over the course of a few days). Being that not all of my site works only on WordPress, this is why I have a custom-coded solution. However, for those whose sites are rendered entirely by WordPress, this new plugin of yours should be a boon for them. I may end up adding some automatic banning features to the plugin, but really it is designed for manually blocking unwanted visitors, users, et al. We’ll see what the future holds though, the possibilities are endless. Is there the possibiltiy (in free or pro version) to ban users for a limited time (length that could be set for each user, for example if i want to ban a user 1 week, and another 1 day) ? If not, is it something you could implement it ? I never found a plugin to manage ban this way. 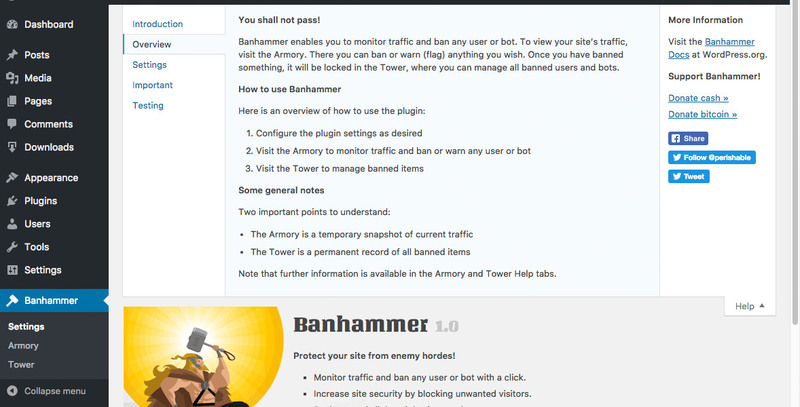 Awesome ideas, I will see what I can do in future versions of Banhammer Pro. Thank you for the feedback.